COTUIT, Mass. 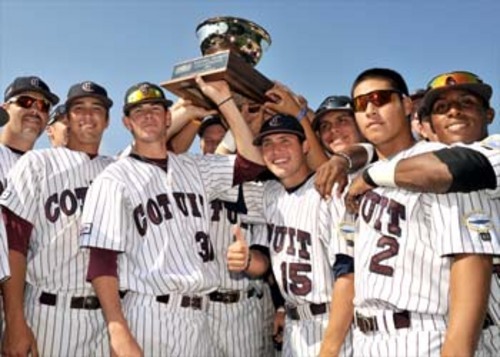 -- A U-Haul trailer would have come in handy on opening day of the playoffs as Cape League officials transported four trophies to Elizabeth Lowell Park for a presentation to the Cotuit Kettleers. Among the hardware were two awards based on the Cape League point system and final standings. Cotuit, 30- 14, was presented with the Western Division Championship bowl for finishing in first place in that division. In addition it received the first year of the President’s Trophy for racking up the most points, 60, in the entire league. League President Judy Walden Scarafile and Director of Public Relations, John Garner presented the trophies to the entire team as they poured out of the dugout. They proudly held it up for all to see with loud cheers from the players and fans. "The Cape League is the best amateur baseball league in the USA. The Kettleer players & coaches in 2012 have enjoyed the wonderful competition with the other nine outstanding teams and know how fortunate we have been to win the President's Trophy," said Field Managers Mike Roberts . Cotuit had an exciting run at the end of the season, going 8 – 2 in the last 10 games. It also finished the season with four power hitters batting over .300. One of those was League Batting Champ, Patrick Biondi who also received his trophy this day. The Kettleers had exceptional pitching as well with four pitchers’ holding ERAs under 2.00 . Dan Slania, with an ERA of 1.52 also received the Outstanding Relief Pitcher at the pre-game presentation. Arnold Mycock, General Manager Emeritus of Cotuit had this to say about the two team awards.